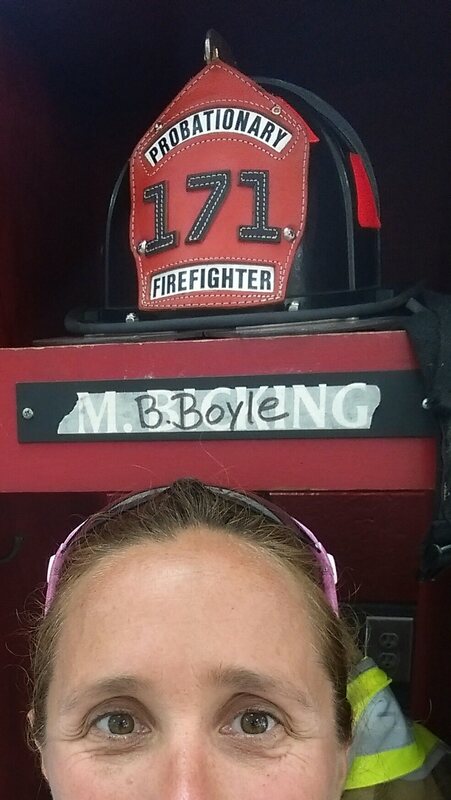 I’ve always wanted a shirt that implied I was a firefighter. 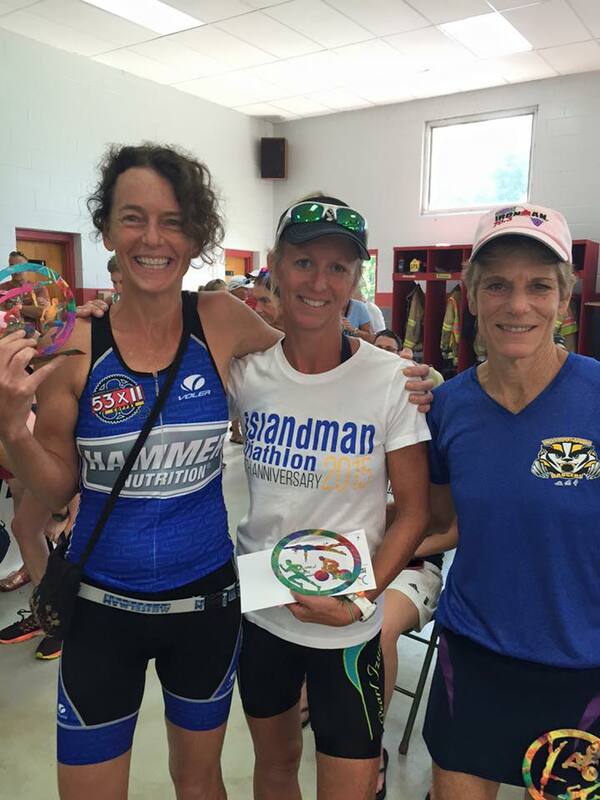 On Saturday, the team raced at DQ’s Vincentown Sprint. 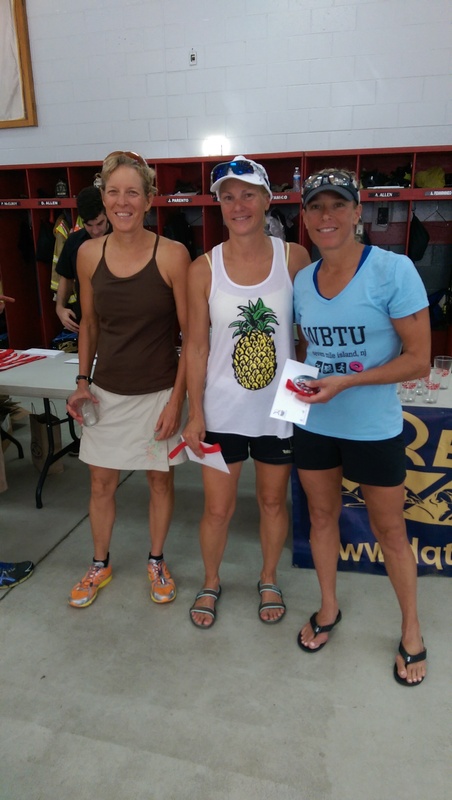 DQ is a local company that puts on great, less expensive, no-frills races in South Jersey. The races are quick and simple, but very well organized and always competitive. 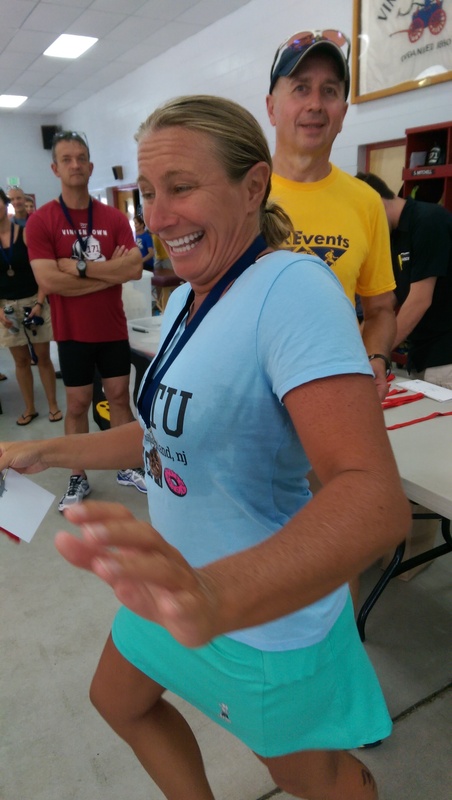 The Vincentown sprint consisted of a 1/4 mile lake swim, a 15 mile bike, and a 5K swim, with both packet pick-up and awards in the Vincentown Fire Company. Resisting temptation to wear the hat. 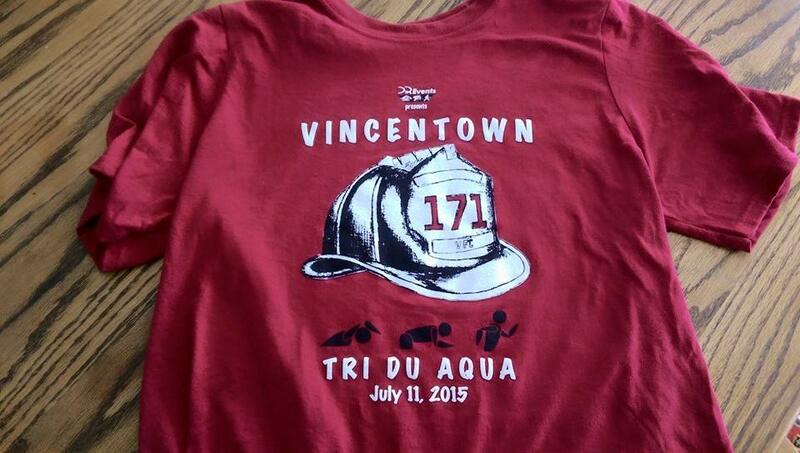 The Vincentown race was not originally on the TMT Tour de Shore schedule. Last year on the same weekend, the team raced Lake Len-AH-pay in the morning and the Iron Soldiers Biathlon at night, with drunkenness and pizza in between. (Click here for the total debauchery report.) But Lake Len-AH-pay was cancelled and Iron Soldiers was moved to the following weekend. All of this devastated the Jelly Bean, as this was one of the few opportunities that she has to race with the team this summer due to her many scheduled hangovers. There’s a DQ race almost every weekend of the summer, so it served as an excellent last minute replacement and most of the team jumped in. I’ll describe the race in reverse chronological order. This will allow me to build to the end, which is actually the beginning, which is where the drama lies. It’s a sophisticated writing technique. It’s called “going backwards” or something. 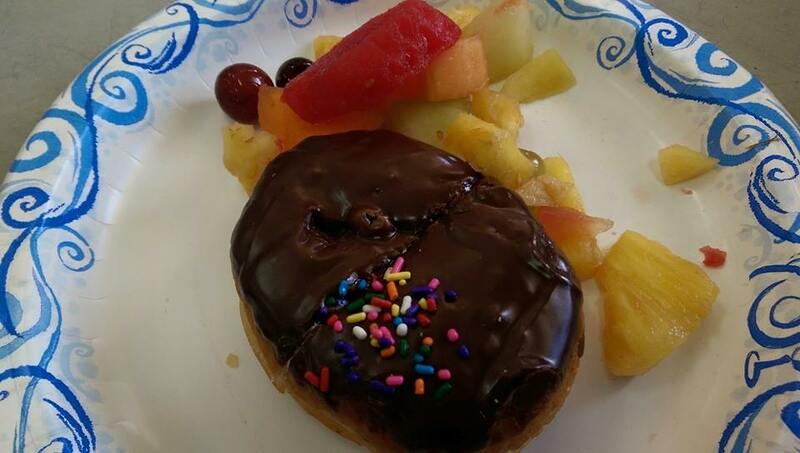 POST-RACE REFRESHMENTS: Dunkin’ Donuts provided by DQ, champagne provided by Mrs. Donovan (the birthday girl). #Finishlinefood. Hey Reverend. What’s that behind your back? The fruit made for a lovely garnish. But you can’t eat the garnish. Nice photo bomb, Chuck Sellers. The Rev received two demerits for being out of uniform with this pineapple get-up. RUN: Very nice. One big loop with lots of shade. Susie Pick Up and I arrived at T2 at the same time, so we ran a leisurely 5K together. There was pleasant conversation and laughter. It was civilized. BIKE: Two loops, wide-open country roads with a decent shoulder. I thought I was riding pretty well until about 5 women who were in my age group passed me within the first five miles. Oof. It then became less of a race and more of a workout. SWIM: As Jimmy Fallon would say, “Ewwwwwww.” Everyone warned me that the swim was gross. But I ignored their warnings, because I’m tough like that. Seeing it from afar, the lake looked lovely. Upon closer visual and olfactory inspection, no. You couldn’t see anything while swimming, and it stunk. My nice, white Paincave race top became black. I knew right then that I would have a terrible race. How can you race good when you don’t look good? You can’t. Plain and simple. The swim was wetsuit legal, but I opted to skip it with the water temp at 77. Bad move. It would have kept me so much cleaner, and then I would have won my age group, maybe the entire race. THIS ENTIRE LEG OF THE RACE WAS AN UNMITIGATED, FILTHY, DIRTY DISASTER. 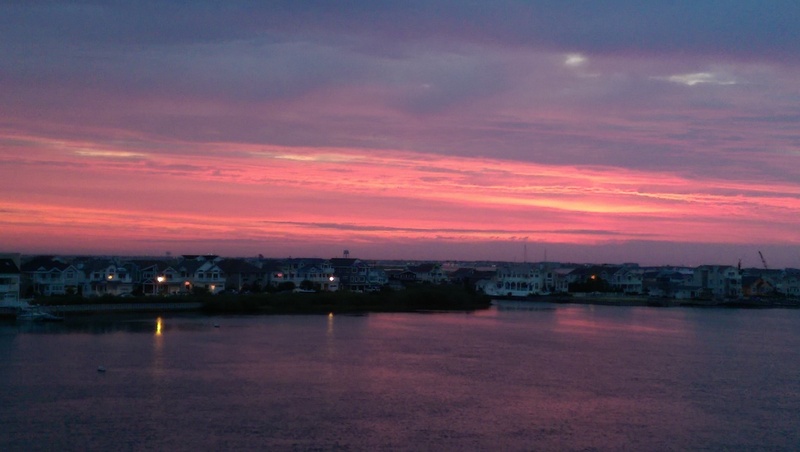 I pedaled at 5:30 a.m. to meet Susie and her pick up, and got to enjoy this. 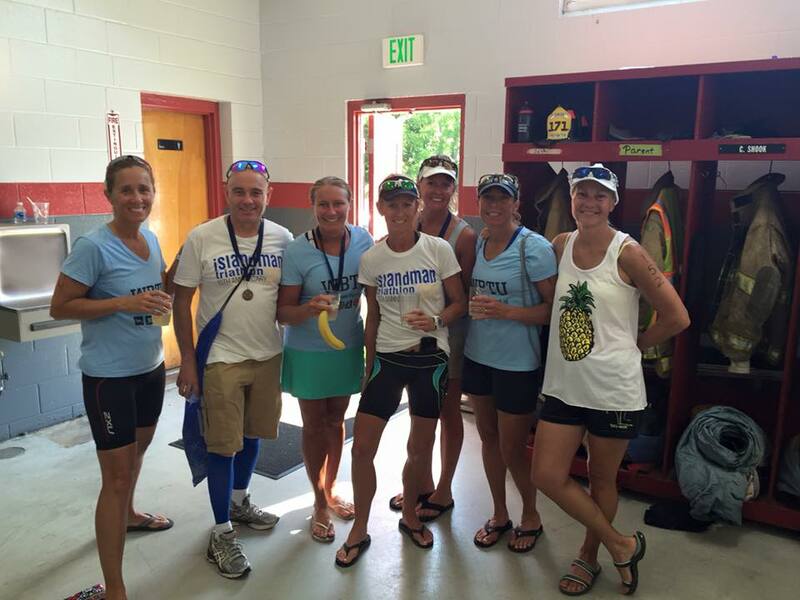 The moral of this race report is that any race is fabulous when you are with your friends. You didn’t know that a race report could have a moral, did you? Well, mine do. Maybe I should be The Reverend.